A farmer in Ara district, Bihar state, applies NPK fertilizer, composed primarily of nitrogen, phosphorus and potassium. The application of fertilizers that do not meet the nutrient requirements (i.e. balanced nutrient application) of target crops is a widespread problem in India. Farmers overuse urea (N) and seldom apply secondary nutrients (Sulphur, Calcium, and Magnesium) and micro-nutrients (like Zinc, Iron, Copper, Boron, Molybdenum and Manganese) in their plots. This imbalanced application of nutrients affects both long-term health of the soil as well as farmers’ own net incomes from agriculture. 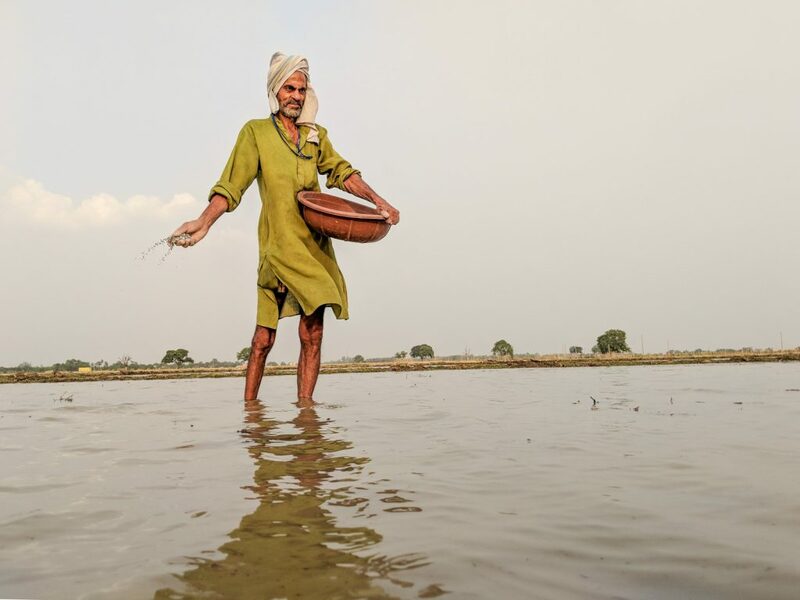 How do we deploy scientific research, business innovations, and public policies and programs to help promote balanced use of fertilizers in Indian agriculture? As part of the Cereal Systems Initiative for South Asia (CSISA), the International Food Policy Research Institute (IFPRI) and the International Plant Nutrition Institute (IPNI) organized a National Dialogue on “Innovations for Promoting Balanced Application of Macro and Micro Nutrient Fertilizers in Indian Agriculture” on December 12, 2018, in New Delhi, India, to discuss practical answers to these questions. Farmer leaders, representatives from fertilizer cooperatives, private companies and the Fertilizer Association of India (FAI) participated in the dialogue along with state officials, researchers from national research institutions, CG centers, the World Bank and Indian think tanks to share their ideas and experience and explore new strategies. This dialogue initiated conversations on three themes: a) policy changes and other innovations needed to accelerate the development of new fertilizer blends; b) ways to develop a soil intelligence system for India, and c) changes in extension and communication of soil health information to farmers to enable the adoption of scientific recommendations. The introductory session provided the necessary background and the context for the deliberations that followed. Avinash Kishore of IFPRI presented evidence on the myth of farmers being highly sensitive to changes in fertilizer prices. Using plot-level data from a large nationally representative sample of farmers, he showed that farmers’ demand for DAP and Potash did not change significantly, even after a steep increase in prices after a change in subsidy policy in 2011. Avinash contended that removal or rationalization of subsidies alone will not be enough to promote balanced use of fertilizers. Scientifically informed extension efforts would still be needed. The Director General of the Fertilizer Association of India (FAI), Shri Satish Chander, pointed out that new-product approvals in India take approximately 800 days. However, he explained, this delay is not the biggest problem facing the sector: other barriers include existing price controls that are highly contingent on political myths. Andrew McDonald of CIMMYT emphasized the need to develop a soil intelligence system for India and shared CSISA’s ongoing work on developing such a system for Andhra Pradesh and Bihar. In both states, scientists are working to combine the rich data already collected under the Soil Health Cards (SHC) program with spectroscopic measurement of soil properties and remote sensing images to create a rich array of information on soil and plant nutrition requirements customized to the specific needs of farmers and policymakers at a landscape level. Dr. T. Satyanarayana of IPNI highlighted the importance of micronutrients in promoting balanced fertilization of soils and innovative methods that exist in determining soil health for appropriate action. Mr. Ajay Vir Jakhar, chairman of Punjab Farmers’ Commission, highlighted the need to strengthen the public extension system to bring scientific information to farmers. Director General of FAI, Shri Satish Chander, averred that while approval of new fertilizer blends in India is slow and cumbersome, it is not the main hurdle to move innovation in India’s fertilizer sector. The Fertilizer Control Order (FCO) has undergone reforms over the years. While more reforms in the FCO will be helpful, price control and heavy subsidy on Urea, a large share of which, he said, goes to international fertilizer companies and not farmers, was the big problem in India’s fertilizer sector. Other representatives from the fertilizer industry touched upon the need to identify farmer requirements for risk mitigation, labor shortages and site-specific nutrient management needs for custom fertilizer blends. Participants also discussed field evidence related to India’s soil health card scheme. Ultimately, discussions held at the roundtable helped identify relevant policy gaps.